Mohammad Morsi, the new President of Egypt, we don’t know how he’ll do in the future, but we know one thing for sure, what he did in the capital of the Neo-Zoroastrian Rafidite Safavid state will cool the hearts of all the believers whenever they remember him. 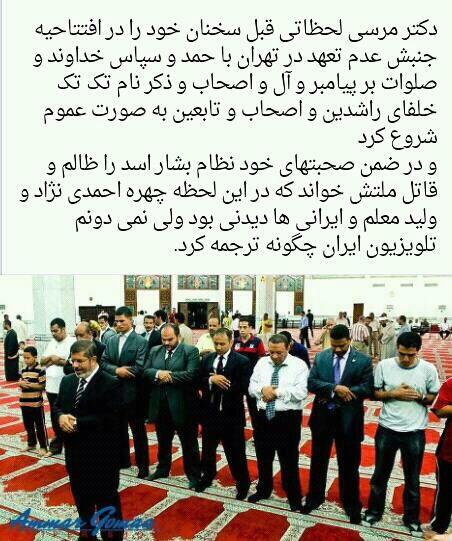 Basically Mohammad Morsi visited the Summit of the Non-Aligned Movements held in Tehran on Thursday. That means it was not an official visit to Iran (the Safavid regime desperately hopes for that, since they boldly claim that the Revolutions in Egypt and the rest of the Arab world were inspired by their khomeinian-Shi’ite revolution!) the summit just happned to be there and Mohammad Morsi left shortly without even meeting the Taghoot and Wali Al-Amr of the heretics, Ali Khamenei (whom many visited). Addressing leaders and representatives of 120 countries, Morsi delivered several political messages. He began by sending peace and blessings on Prophet Mohammad, his family and his companions, and on the Caliphs Abu Bakr, Omar, Othman and Ali, something the Rafidite regime did not like too much. 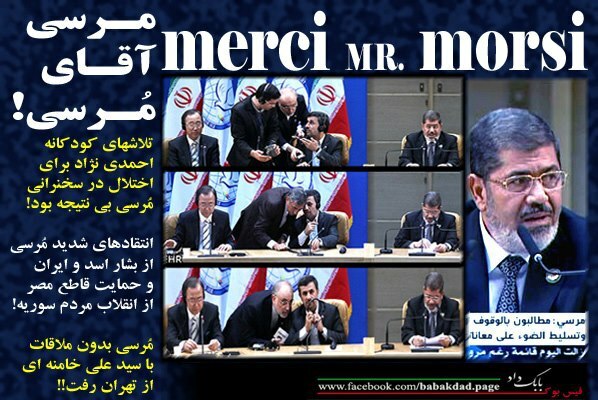 Not everyone in Iran would have noticed, as one Iranian state TV channel (and plenty of newspapers) mistranslated Mr Mursi’s words into Persian, giving the impression that president was actually speaking in support of the Syrian government, let alone that the translator ommitted the parts where Mursi also sent blessings on the companions of the Messenger of Allah whom the Rafidite Shi’ites hate. – Iranian media removed the names of Abu Bakr, ‘Omar from the speech, and others removed all the names of the Rightly Guided Caliphs. Others did not even translations that part which was the most important aspect of his speech. 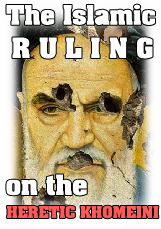 As for the hope of the Iranian regime, it was to show the West the so called Islamic Republic had plenty of friends elsewhere, but Mohammad Mursi’s comments would certainly have upset the two faced hosts. 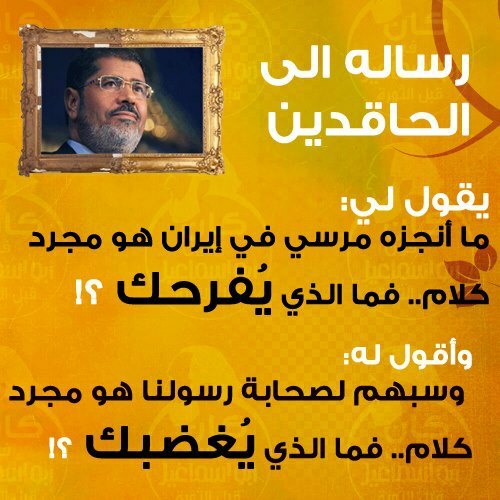 translation: He told me: What Mursi accomplished in Iran are just words … So what’s making you happy? So I said: And their (Rafidah Shias) insults and slanders of the Companions of the Messenger are just words … So what’s making you upset?